Japan Airlines (JAL) is serving a Kentucky Fried Chicken (KFC) meal on flights from Tokyo (Narita) to New York, San Diego, Chicago, Boston, Los Angeles, London, Frankfurt and Paris. 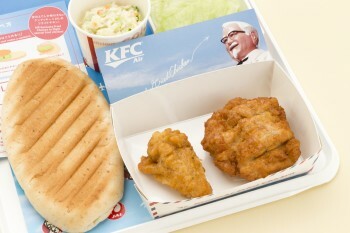 The meal, named Air Kentucky, will include a drumstick, chicken breast, flat bread and coleslaw. The meal was introduced on December 1 and will be served till February 28. The meal, though, looks a bit insufficient in quantity to serve as a proper standalone meal. If you’re flying on one of Japan Air’s long-haul flights, you might consider including some snacks in your carry-on – or risk being very hungry when you arrive.